"I was feeling so headachy all the time, ever since we plugged in our wireless router. We really need it because my husband and I both work from home and our offices are on different floors. My husband felt dizzy a lot and had to take naps in the afternoon. I was skeptical about your Omega WiFi. I didn’t even tell my husband I was buying it, because I knew he wouldn’t believe it would do anything. "Well, almost as soon as I plugged it in, I was aware suddenly that my chronic headache was gone. I was amazed! It was like I had entered into a whole new zone or dimension. My head was clear. My husband didn’t notice anything until the next day. But then he said, “Honey, what did you put in the coffee? I feel great today—wide awake.” I just laughed and showed him the Omega WiFi." Eliminate Wi-Fi health risks with EarthCalm's Omega WiFi plugged into your router. A beneficial field of protection will extend throughout your home. WA EMF Protection from Laptop Radiation Laptops are especially hazardous. In addition to the radiation generated by the transmitter, an extremely high miligauss field (100 MG) is also emitted when your laptop is on. Create a Grounding Field of EMF Protection The Omega WiFi gives you full wifi radiation protection by incorporating EarthCalm's proprietary technologies to transform these hazardous fields into a beneficial field of protection. 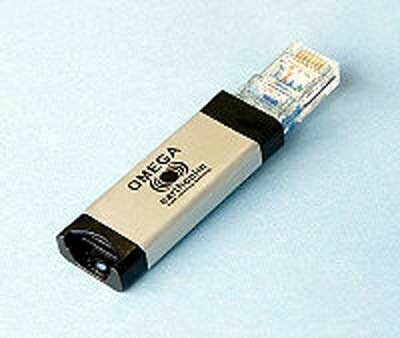 The OMEGA WiFi measures approximately 2-1/4" by 3/4" (the size and shape of a flash drive). It comes with either an Ethernet plug or a USB plug. To determine which version to buy, look at your router or your laptop to see which type of port is available. An output or input port works equally well.therefore generates no EMFs and will last indefinitely. You can turn your home into a calming field of protection by plugging an OMEGA WiFi into your wireless router. Using all three of EarthCalm's proprietary technologies, the OMEGA Wifi actually transforms the field of hazardous microwave radiation into a field that grounds you into the earth's electromagnetic field, where your body can relax, heal and rejuvenate itself. All wireless devices, including Wii, Ipads and other laptops will receive full protection from your router if they are programmed to receive its signal. If you have a laptop but no router--or if you take your laptop away from home--you can plug the OMEGA WiFi into your laptop itself to create the same protective field of up to 5 feet around you. Most people are unaware that their wireless routers and laptops are built with transmitters that constantly generate a cloud of microwave radiation when they are on, even when they are not actively in use--a field highly hazardous to their health. Laptops also generate an extremely high miligauss field from the AC electricity when they are on, putting out as much as a 100-miligauss field at the keyboard. Wireless routers emit a constant cloud of microwave radiation that extends throughout an entire house and beyond. The OMEGA WiFi incorporates EarthCalm’s proprietary technologies to transform the hazardous fields created by routers and laptops into a beneficial field of protection. It does this by modulating EarthCalm grounding patterns into the EMF microwave field generated by the router or laptop, which allows your body to dissipate the effects of the hazardous radiation. In addition, the EarthCalm grounding patterns amplify your ground in the earth’s electromagnetic field, which creates a sense of well-being. Most people notice the relief instantly as soon as they plug in the OMEGA WiFi.